The discovery comes following a year-long study of skeletons found in a mass grave within the New Churchyard, the burial ground excavated by Museum of London Archaeology (MOLA) during construction of the new Elizabeth line station at Liverpool Street in 2015. The mass grave has been dated between 1650 and 1670 using fragments of pottery, glass and coffin handles found within the pit. Local burial records confirm there was a dramatic rise in burial rates in the New Churchyard when the epidemic peaked in the summer of 1665. Historic accounts, such as Daniel Defoe’s ‘A Journal of the Plague Year’ and the Court of Aldermen records, paint a vivid picture of the graveyard’s struggle to cope with a crisis of capacity at that time. Samples from 20 individuals were tested for traces of the plague pathogen Yersinia pestis, and five were found to have been exposed to it before they died. Due to the disease’s virulence it is likely that this exposure was the cause of death. This is the first identification of plague DNA from 17th Century Britain. The bacteria itself perished days after the individuals died 351 years ago and is no longer active. The Great Plague of 1665 was the last major bubonic plague epidemic in Britain and killed an estimated 100,000 people in London, almost a quarter of the population. Despite its scale, the pathogen responsible has eluded detection as the fast-acting disease left no traces on skeletons and the DNA has a low-survival rate when buried in the ground for hundreds of years. Modern scientific techniques have allowed scientists at the Max Planck Institute in Jena, Germany, to isolate this DNA from teeth extracted from the skeletons. The enamel on the teeth acted as protective capsules, preserving the DNA of bacteria that was in the person’s bloodstream at the time of death. Molecular palaeopathologists are now attempting to sequence the pathogen’s full DNA genome. In doing so they hope to be able to compare the 1665 Great Plague to the 1348 Black Death epidemic as well as recent modern outbreaks. This will allow scientists to further understand the evolution and spread of the disease. 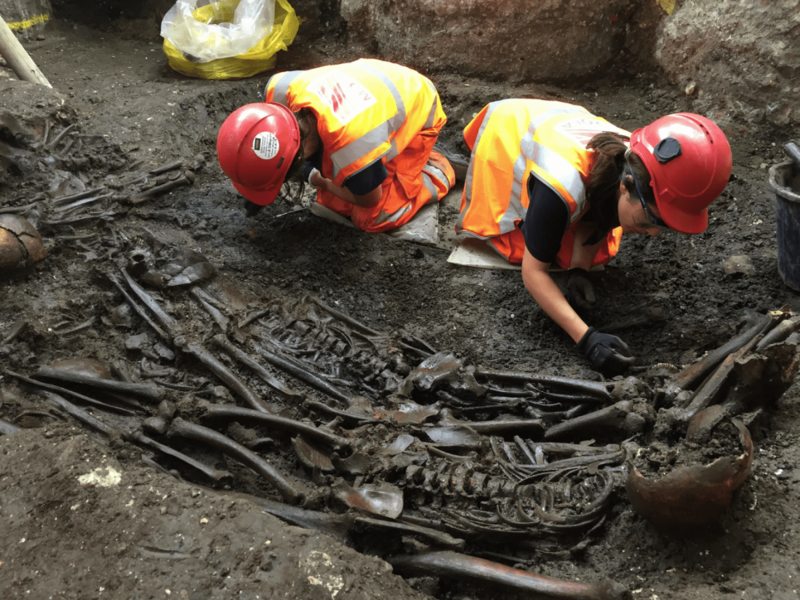 Vanessa Harding, Professor of London History, Birkbeck, University of London, said: “This is a very exciting finding, for the history of London, the history of disease, and the history of burial. It confirms thatYersinia pestis was present in early modern London plague epidemics, and links them epidemiologically with the 14th-Century Black Death and the 1720 Marseille plague. We still need, however, to understand why the disease manifested itself in so many different ways, and whether other pathogens made a significant contribution to these epidemics. In total 42 individuals were excavated from the mass grave but archaeologists estimate that it may have contained as many as 100 people. The predominantly coffined burials were tightly packed in orderly rows that, over the centuries, collapsed in on each other as the coffins decayed. Although contemporary Plague Orders dictated that burials sit a minimum of 6ft from the surface, the top of the mass burial was only about 2ft from the surface. This was perhaps a matter of practicality for the gravediggers but ‘noisome stenches’ were reported, eventually leading to burial restrictions being placed on the New Churchyard. Further scientific analysis of the skeletons will continue over the coming months. Isotopic analysis may reveal where these people grew up and if they moved in their lifetimes, and examination of the material trapped within the plaque on the teeth may show what they ate, and what diseases and pollutants they were exposed to. 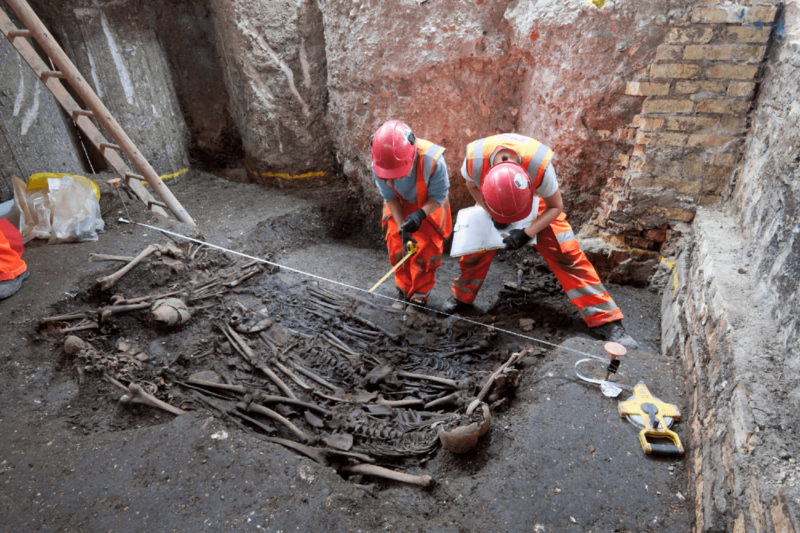 In 2014, skeletons excavated during the construction of the Elizabeth line station at Farringdon were found to contain traces of the DNA of the Yersinia pestis bacteria from the first major plague epidemic in Europe, the 1348 Black Death. Crossrail’s extensive archaeology programme is the largest in the UK. To date it has found more than 10,000 artefacts and fossils spanning 55 million years of London’s past at over 40 construction sites. Full findings from the archaeological excavation at Liverpool Street will be published in early 2017.